Whoever said persistence was a waste of time? Karen Harding proves that taking a risk and appearing on multiple talent shows doesn't only show you can take rejection, but it can also get you a record deal. 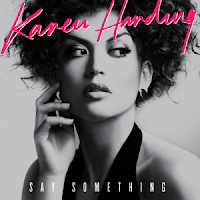 Karen Harding delights us in her debut single's music video, her stage presence is obvious, although she fails to capture us entirely, great singer, visually beautiful, Karen Harding is one to watch for 2016! Karen Harding first appeared on TV as an entrant for 'Your Country Needs You', the UK's selection for Eurovision 2010. She failed to make it past round one and was eliminated. The winner was Josh Dubovie, who was the third UK entrant to come last in the competition. Pretty sure Karen Harding would've done better. She next appeared on the tenth series of The X Factor, but was eliminated during the six chair challenge. And now she's made a name for herself, and hit the top ten of the UK chart with this banger. It just shows persistence does work. The song was written by Karen Harding and Uzo Emenike (MNEK). Directed by Carly Cussen, the video is set in a club, and Karen Harding is just arriving, looking secy and ready to show who she is as an artist. This debut song is perfect for clubs, and so I expected some sort of dance sequence, and although Karen Harding is seen dancing, it looks more like it was choreography she made up so that it doesn't look like she's just singing the song. There is a group of dancers, which Karen Harding is with at certain times, however she isn't dancing with them, especially when the beat picks up and the dance group shows us what they've got, I just wish Karen Harding was dancing with them. Overall a great performance-based music video for the song, however it gives us no narrative whatsoever, and the video doesn't give us much insight into Karen Harding, can she even dance? We need something more from her to really capture our attention, because this song is definitely something.